Zestos: Enabling life through communication of research: Variation in food studies. - they are massive ! Most people do not realize how significant errors or variations are in studies. A study has just been published looking at nutrient intake and food tables. The average intakes were displayed as numbers and I quote "The FFQ estimates (mean ± SD) were 315 ± 132 μg for folate, 3.1 ± 2.1 μg for vitamin B12, 15.4 ± 5.6 mg for iron, and 15.1 ± 6.4 mg for zinc." Did this means anything? Did you just pass over it..... it is because numbers such as these are very difficult to get a handle on. However graph them and it becomes obvious. Now the error bars are the black lines, they are 2 standard deviations, that means it accounts for 95% of the variation. Or 95% of the results are within the black line region. Thus is shows that the average (mean) values of the bar graph are somewhat meaningless because the variation is massive. The percentage variation is nearly as large as the mean! Thus results are not very accurate. However it gets worse. 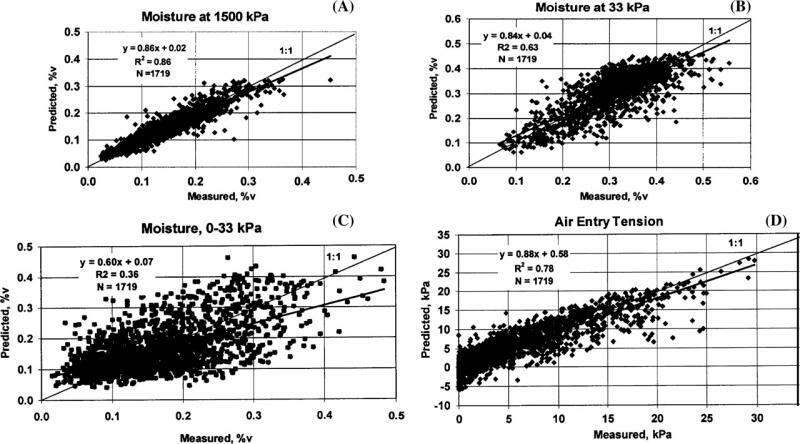 Further one they state "The deattenuated energy-adjusted correlation coefficients ranged from 0.41 (dietary folate equivalents) to 0.60 (folate). Significant correlations between biomarker and nutrient intakes were found for folate (r = 0.37, P < .01) and vitamin B12 (r = 0.27, P < .01)"
Let me decode this. What they are saying is that dietary folate and folate are related to the food table, by and r = 0.41 and 0.6 respectively. Someone who has done statistics, knows R^2 (R squared) is a much better indication of error. 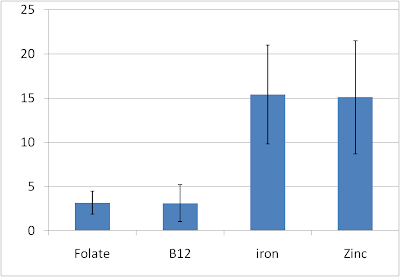 Therefore the correlation between food table and folate levels in blood are 0.17 and 0.36 respectively. Now if you haven't done maths since you left school this is still likely meaningless. Therefore lets draw a graph...... I have trolled around the internet and found a graph that has the R^2 of 0.176, this is shown below. (picture credit). 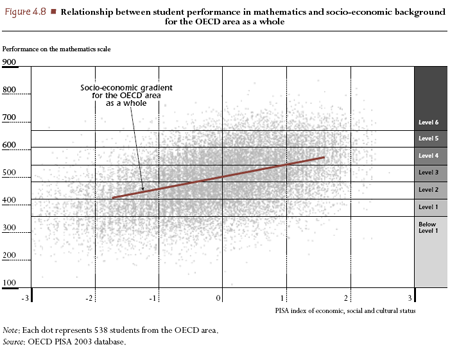 Don't worry about what is on the axis, just look at the red line and the data spread (each grey dot) around the line. The spread of data around the line has the same errors as the relationship between the estimation of dietary folate equivalents in the blood using food tables and what the dietary folate equivalents were in the blood. Most people wouldn't say there was a correlation..... yet the paper concludes there was. The following four graphs are also very useful. The relationship between estimation of folate in the blood using food tables and what the dietary folate were in the blood had an R^2 of 0.36. The graphs below (credit) have R^2 on them, which are for A = 0.86, B=0.63, D = 0.78. These three graphs have what we would call correlations. However the R^2 for graph C is 0.36, the same as the correlation of estimated folate and actual folate. Most people wouldn't think that where was a correlation for graph C ! So when people stand up and say that food tables are a useful tool in estimating vitamin intake..... they might mean that their correlations are as good as the above graphs - ie terrible!!!! !